New shawl pattern – Lacymmetry! Lacymmetry is a shawl that makes me happy. I like the lace, I love the lines of the shawl, and the way it all came together is just plain satisfying. I hope you enjoy it as much as I do! This week I’ve published two more patterns: a pair of mitts called Meeting-of-the-Waters and Sycamore Creek, a shawl pattern. Meeting-of-the-Waters looks like a very plain fingerless mitt pattern, but there’s two twists: one, they’re knit from the top down to make maximum use of your yarn, and two, they’re designed to make a pair of matching mitts from yarn that wouldn’t otherwise make that possible. The trick? Steeks! That is, knitting them in a single piece, cutting them apart, and sewing up the cut edges. 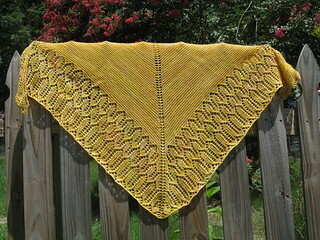 Sycamore Creek is a very deep shawl with an angled long edge. It covers the wearer’s back nicely and stays on the shoulders. It’s also great for stash busting! Click through for more about each of these. New Hope Creek is designed to be knit with two skeins of yarn that coordinate with each other but that don’t match exactly. The shape is crescent-like – formed by knitting five triangles pointing in alternating directions. The sample is knit with one muted skein and one that’s wildly variegated with short runs of color; I think of this as one mild and one wild. Many variations are possible: one gradient and one wildly variegated yarn, two self-striping yarns with different length stripes, multiple scrap yarns left over from other projects, even two solid yarns. Instructions are also provided for working with a single yarn. Pattern announcement! The Ellerbe Creek set is now complete. 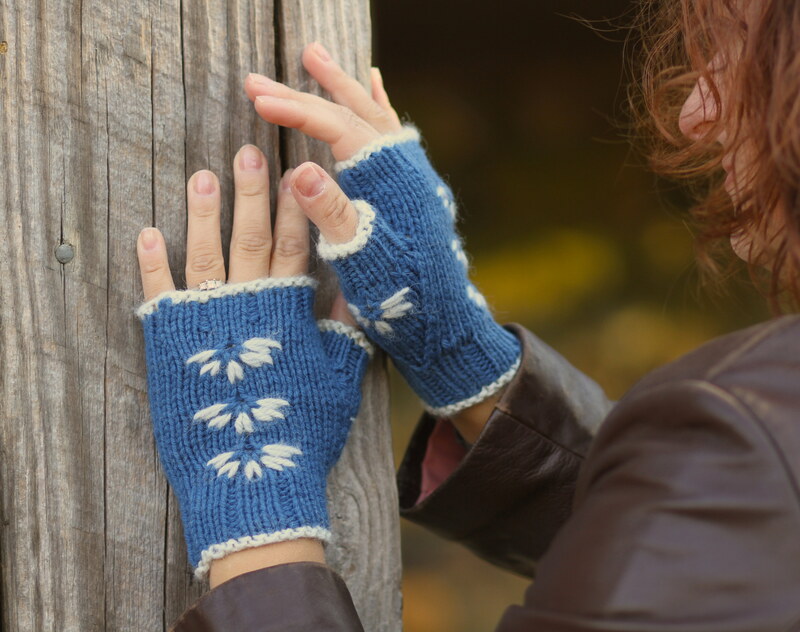 A purchase of either of my Ellerbe patterns on the Ravelry website (don’t use the buy now button on this page) means a US$2 discount on buying the other. Discount is automatically applied at checkout. Ellerbe Creek runs through Durham, North Carolina. I love going for walks by the creek and will donate ten percent of my proceeds from this hat to the Ellerbe Creek Watershed Association. If you’re on Ravelry, please join me for a knitalong on my group – if you finish either the hat or the mitts by the end of November, there will be prizes! Knitalong signup and details here. To fit head sizes 18 (20, 22) inches [46 (51, 56) cm]. Brim measures 16 (18, 20) inches [40.5 (46, 51) cm] just above ribbing. You can also increase to the desired diameter (about 2 inches [5cm] less than head size) and work from there, making it easy to adapt this to other yarns or head sizes, or to a beanie. 18 stitches and 26 rounds over 4 inches [10cm] in stockinette on larger needles. 137 (177, 220) yards [125.5 (162, 201.5) m] of main color worsted weight yarn. Sample is worked in Quince & Co. Lark. 8 yards [7.5m] of contrast color worsted weight yarn (or extra of main color). Sample uses Berocco Ultra Alpaca. US size 8 [5mm] needles for working in the round. US size 7 [4.5mm] needles for ribbing in the round. darning needle for working in ends. You need to know how to cast on, bind off, knit, purl, yarn over, slip stitches, cable, increase, decrease, and knit in the round. Both written instructions and a chart are provided. This is my friend Sarah’s shawl, Clara. We’re having a knit-a-long for it on our Ravelry group. I’m really looking forward to making it! We’d love to have people join us.